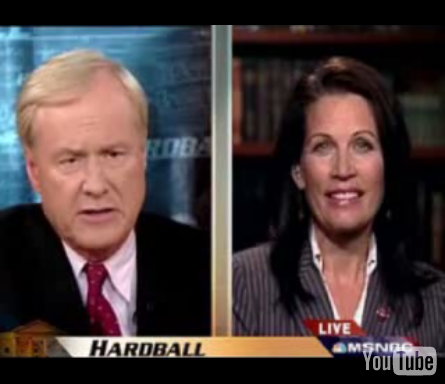 I just watched Chris Matthews’ interview with Rep. Michele Bachmann (R-MN) and have to say I find equal fault with Matthew’s line of questioning as with Bachmann’s McCarthian-esque quote in the closing moments of the segment. By ‘fault’ I’m referring to the circumstances that lead to the utterance of such a reprehensible statement. Chris Matthews spent much of the interview doing two things: Linking the terms “liberal,” “leftist” and “anti-American,” and pushing Bachmann into the corner where she ultimately stumbled. Chris Matthews is just as accountable for the impact of that interview as is the Representative, because he drove the conversation in that direction. At the onset, the interview was about Obama’s connection to Bill Ayers. But the intentions of the two participants became quickly clear: Bachmann wanted to achieve mistrust of Obama by way of speculation and innuendo, and Matthews wanted to pin her in claiming liberals (or likely, Democrats) were anti-American. I think the witch hunt comments at the end were just icing on MSNBC’s cake. Like any good salesman who stops the sales pitch when the customer ultimately says yes, Matthews concluded the interview just after the Congresswoman’s call for a “penetrating expose” provided what will and has proven to be a damning sound bite. I am troubled by the implication that those who are not supporters of the nation’s current direction are not “real Americans” – a term I’ve taken from recent Republican stump speeches. I find it divisive and inflammatory. Possessing alternative viewpoints and engaging in dialogue do not undermine our nation’s patriotic interests. Bachmann’s comments reflect this implication. At the same time, however, Matthews tactics were equally profane in the way they steered her into oncoming traffic. Surely he knew where he was going and how he was going to get there. He consistently linked those terms until his interviewee finally took the bait. He spoke over her and cut her off. Frankly I’m a little surprised Bachmann let him get away with this. You can clearly see she does not intend the interview to go the way it is as her eyes widen and her words find pause. Were it me up there I would have stopped and said, “Whoa Chris, what are you doing where are you taking this? What are you trying to say?” That may have saved her political career. Instead she fell into a thinly-veiled trap built by her party’s narrow-minded, politically-fueled definition of patriotism and a Democratic-leaning television station’s proliferation with creating sound bites. In the end, the single-term U.S. Representative was bested by a Washington insider who has a lot more experience in this game than she does. This entry was posted on 22 October 2008 at 8:38 am	and is filed under Uncategorized. Tagged: bachmann, chris matthews, MSNBC. You can follow any responses to this entry through the RSS 2.0 feed. You can leave a response, or trackback from your own site.